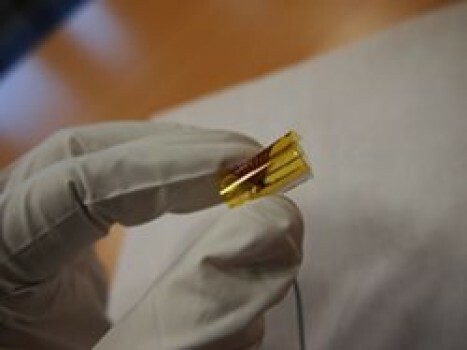 Belgian researchers say they have created the first optical circuit that uses interconnections that are stretchable as well as bendable.The technology has applications like wearable body sensors and robotic skin. These new interconnections, made of a rubbery transparent material called PDMS (polydimethylsiloxane), guide light along their path even when stretched up to 30% and when bent around an object the diameter of a human finger. By integrating these stretchy interconnections into a circuit — with a light source on one end and a detector on the other — the researchers created a miniature stretchable, bendable “link” that could be incorporated into optical communications systems. The team describes its work in a paper published in the Optical Society’s (OSA) open-access journal Optics Express. Researchers have created optical interconnections — also called lightguides or waveguides — from similar rubbery materials. But until now, the researchers say, no one had discovered a way to enable these materials to carry light while stretched. The new connector consists of two materials, both made of PDMS: a transparent core through which the light travels, surrounded by another transparent layer of PDMS with a lower refractive index (a measure of how much light is refracted, or bent). This configuration traps light in the guide’s core, causing it to propagate along its length, even when stretched or bent. Future uses for the new optical link might include building networks of wearable body sensors, machine parts in motion such as robotic limbs, and deformable consumer electronics. Meanwhile, the team plans to make their waveguide smaller, down from 50 microns (millionths of a meter) to just a few microns in diameter. This work has been performed at the Centre for Microsystems Technology (CMST), a laboratory associated with imec and Ghent University. We introduce the concept of mechanically stretchable optical waveguides. The technology to fabricate these waveguides is based on a cost-efficient replication method, employing commercially available polydimethylsiloxane (PDMS) materials. Furthermore, VCSELs (λ = 850 nm) and photodiodes, embedded in a flexible package, were integrated with the waveguides to obtain a truly bendable, stretchable and mechanically deformable optical link. Since these sources and detectors were integrated, it was possible to determine the influence of bending and stretching on the waveguide performance.